BP is on the verge of escaping headlines, and if you’re ready to forget about the oil spill, fine. But disasters just like the Gulf spill are playing out across the country. Yesterday, BP cemented the well that has been spewing oil into the Gulf of Mexico shut. The Obama administration is saying that the majority of the oil released is no longer a problem (ed. note: oh, really?). The spill was supposed to drive the Senate to finally pass a bill touching on energy issues and taking the oil industry to task, but this week Senate Majority Leader Harry Reid (D-NV) pushed back work on his minimalist energy bill until the fall. But in states like Michigan and New York, similar stories are developing on smaller scales. For-profit companies, unburdened by strong regulations, are taking what they want, regardless of the consequences for the environment or for communities that depend on having clean soil, air, and water. The last of the BP oil spill? One hundred and eight days after the Deepwater Horizon rig exploded, it looks like oil will finally stop flowing into the Gulf. On Wednesday, the Obama administration released a report showing that much of the 5 million barrels of the spilled oil — three-fourths, even — had been collected, dispersed or evaporated. By Thursday morning, those claims were already on thin ice, with some scientists saying the administration had rested its analysis on assumptions that would help them paint a rosy picture. Chen gets her information from an analysis conducted by the Environmental Justice Resource Center at Clark Atlanta University. In essence, the study says, the dumping grounds to which BP is sending 61% of disposable oil spill waste are located in places where people of color make up the majority of the surrounding community. The repercussions of the BP spill may linger, but similar stories are playing out all the time. 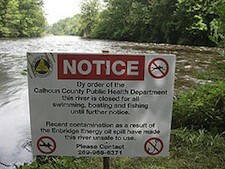 The clearest example right now comes from Michigan, where a faulty pipeline let almost one million gallons of oil spill into a tributary of the Kalamazoo River. The spill may be the biggest in Midwest history, and at the Michigan Messenger, Eartha Jane Melzer is reporting that the company at fault, Enbridge Energy, has offered to buy houses along the affected stretch of river. In Washington, a couple of Congressmen have begun sniffing around Enbridge’s practices. The Washington Independent’s Andrew Restuccia found that the Pipeline and Hazardous Materials Safety Administration, which is charged with overseeing the integrity of the pipelines carrying oil from place to place, is riddled with familiar rot. According to his report, the agency boasts both leaders who’ve been through the revolving door and a willingness to grant safety waivers that could put normal people in harm’s way. The Kalamazoo spill has garnered additional attention due to the larger BP spill. But so far it looks like the company at fault will not have to face major consequences for its errors. And indeed, AlterNet writes, the state senate in New York voted this week to wait on natural gas drilling. The state’s assembly must approve it, too, however. Like the oil spill in Michigan, like the BP oil spill, natural gas drilling is one more case where big energy companies are more concerned with profit than people—or the planet on which we live.